This issue marks the big confrontation between Doctor Death and Bruce Wayne that was setup in the previous issue. And all with Lucius Fox in a major supporting role. Scott starts off the issue with an absolute bang, with some really well-written (and well-drawn by Greg, of course) scenes as we see Death go after Lucius and then Bruce. The villain is completely crazy, in more ways than one, and Scott gives him a unique voice as a character so that he can stand out from all the other villains that we have seen in the series so far, or in the New 52 in general, as far as all the Batman villains are concerned. The second major plot thread that Scott deals with here is Bruce’s distrust and hate for Jim Gordon. It is a staple of the Batman lore that he and Gordon and Batman have been friends for almost forever and that their professional relationship is one of friendship. Scott turned all of that on its head for Zero Year by giving Bruce a reason to intensely hate Gordon. After all the hints in the previous issues, we finally get a good sense of Bruce’s reasons for doing so and those pages are some of the best in this issue, packed to the brim with intense character drama and near-violence. This hate that Bruce has for Gordon has been an important, if otherwise minor, plot thread for the big arc and so its nice to see that Scott is committed to the idea of it, and that he is teasing out the story. Slowly but surely, he is getting there for sure. There are also a few really interesting scenes that are undoubtedly flashbacks to Bruce’s time spent in traveling Africa and picking up some skills along the way. This is in keep with a backup story a few issues ago which put Bruce somewhere in Iceland or the Scandinavian lands and we saw him… training. I wonder what kind of a story Scott is telling this time. It is something that I am most definitely interested in seeing come to its conclusion. The wonderful art team of Greg, inker Danny Miki, colourist Fco Plascencia and letterer Steve Wands continues to work its magic. Like I said earlier, the previous issue was a really disappointing one, and just as Scott does with the story, so do the artists with their assigned duties on this issue. This is the issue where they go full-out for Doctor Death and Capullo’s pencils conjure up a really vivid image of the character here. He is supremely creepy and scary at the same time, Doctor Death that is, not Greg, and I think that the way he is drawn, and the way that Scott writes him, we can definitely expect some more goodness from him as well. Fco continues to the trademark style of giving spectrums of colours in the internal artwork, and the range of execution shown here is definitely impressive. Again, I wonder what really happened in the previous issue. But overall, this issue was most definitely worth the price of admission. Glad to see the series back on track. More Batman: #1-10, #11-12, Annual #1, #13-15, #16-18, #19-21, Annual #2, #22-23, #23.1, #23.3, #23.4, #24, #25. 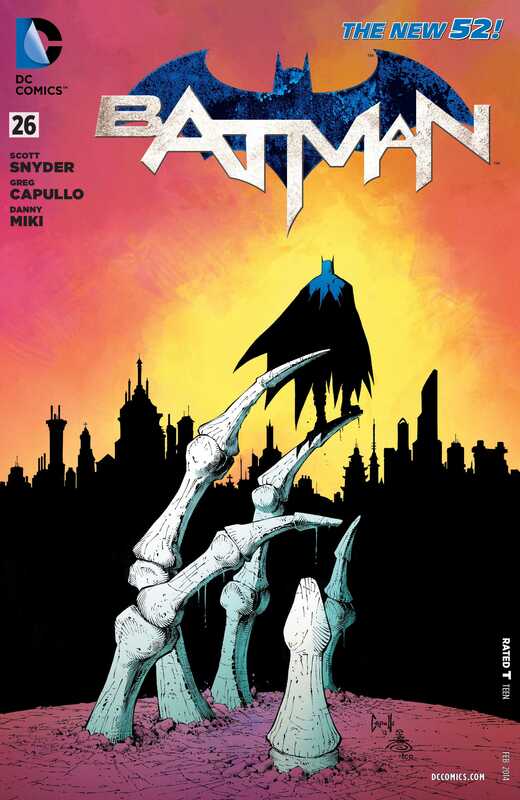 Posted on December 13, 2013, in Comics Reviews, Review Central and tagged Batman, Blond, Bruce Wayne, Comics, Comics Review, Commissioner Gordon, Crime, DC Comics, Doctor Death, Gotham, Greg Capullo, New 52, Review, Review Central, Riddler, Scott Snyder, Superheroes, Zero Year. Bookmark the permalink. 6 Comments.